Pamela Spiro Wagner's art depicts time in seclusion, restraint. "They don't want you to get out. They pull [restraints] as tight as possible to the sides of the bed." "That's made of Vogue magazines. If you look at it, you'll see there's a little label of Prada leather on the leather restraints, which was done on purpose," Wagner said. She made it while alone in a hospital seclusion room. The magazines were the only art supplies she had. Wagner has schizophrenia. She's been in and out of Connecticut hospitals for decades, and she knows what it's like to be restrained. "They use leather, or rubber, or plastic, or whatever restraints that they wrap around your wrists, usually tight because they don't want you to get out. They pull them as tight as possible to the sides of the bed," she said. Wagner was put in four-point restraints. That means each limb is bolted to the bed, and she said she's stayed there for nearly a day at a time. "I would just scream from the base of my lungs," she said, "like the screams that if you had any heart, your heart would break if you heard me scream." Patricia Rehmer, Commissioner of the Connecticut Department of Mental Health and Addiction Services, said the department has cut down on restraint since receiving a federal grant in 2008. "We know," she said. "The literature is clear; the clients are clear. Seclusion and restraint is usually a pretty traumatic event. If we had our way, there would be no seclusion and restraint. We'd love to get to zero, but that's not always possible." Restraining or secluding patients used to be commonplace in psychiatric facilities, but ten years after a series of deaths nationwide, there's been a push to lessen the time patients spend restrained. Federal data released earlier this month showed that Connecticut's rates of restraint are still high compared to most of the country – more than double the national average. The state ranks eleventh nationwide, and third for use of restraints among the elderly. "We realized about a year and a half ago that we were really having a problem," said Ryan O'Connell, Bridgeport Hospital's vice president of performance and risk management. He pointed out that the numbers only go up to the middle of 2013, and said that the hospital started changing its practices since then. "It was much more common for us to go to some type of restraint," he said. O'Connell said the image of the barren room and four leather straps is all wrong at Bridgeport. They're mostly trying to keep patients with dementia from wandering off and into danger. "I think it's really important," he said, "that nobody thinks that we were tying people down [by their] hands and feet." Bridgeport is moving toward something called comfort rooms, with colorful wallpaper, toys, games, or comfortable furniture. They're becoming common alternatives in a lot of institutions, like Connecticut Valley Hospital in Middletown -- a state hospital that cut back on using restraints by about 88 percent in the past decade. In 2002, a patient died after being restrained at CVH. 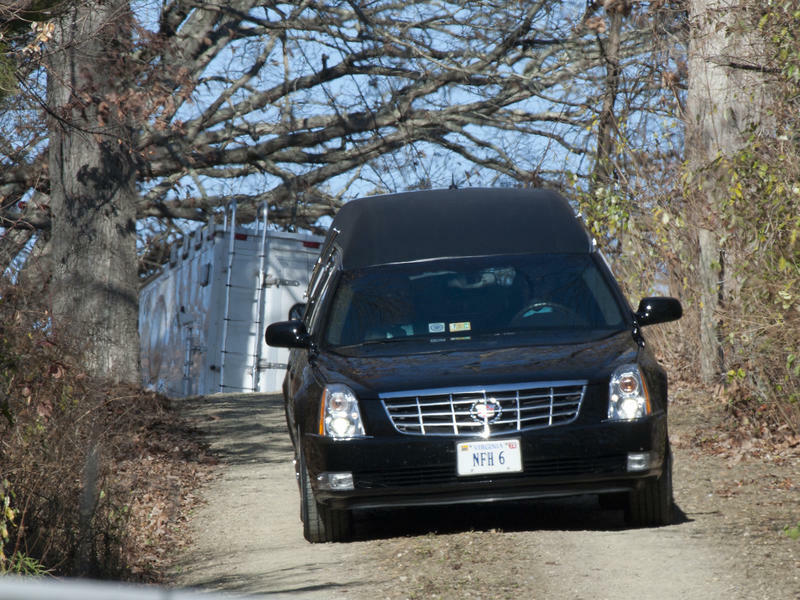 The hospital conducted investigations after the death, but Director Charles Dike said they'd already decided to make a change before it happened. "Our target is to make sure we use it as sparingly as possible, only when it is absolutely necessary, and that we discontinue it as quickly as possible," he said. CVH started using comfort rooms years ago. Dike said that instead of putting a patient in restraints, they try to encourage a patient to spend a little time alone doing something relaxing. He said, "If somebody says to me, when I'm not doing so well, I like to go into my room and play music, and that helps me calm down..." He said that nurses will remember, and bring it up if the patient starts to lose control. Dike doesn't expect to stop using restraints. He said there will always be outliers -- patients who come straight from emergency rooms and prisons. Ellen Blair is the nurse director at Hartford's Institute of Living, which is part of the Hartford Hospital system. 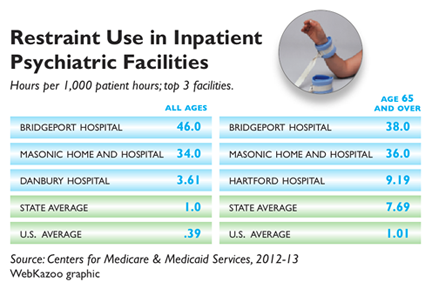 Figures for 2013 show Hartford Hospital restrains patients at a little over the state average, but she said they've cut back since then thanks to new training programs and more comfort rooms. Blair said that when a patient does go into restraints, they're looked after. "I personally go and make sure I know that patient," she said. "We all talk about it at least every couple of hours, because we don't want to keep it going any longer than we have to." She said patients aren't left alone, and that restraint is only used as a last resort when patients are dangerous to themselves or others. "Every day," Blair said, "we come here thinking, okay, we're going to have a good day. We're going to prevent people from getting agitated and having to go to that level." Restraint, however, remains a last resort these hospitals said they don't plan to take off the table entirely. Parents who have a child struggling with serious mental illness live in fear that the worst will happen. The apparent suicide of a young man in Virginia after he allegedly attacked his father, a state senator, shows how difficult it can be for families to get help in the midst of a mental health crisis. The recession brought deep cuts in states' spending on mental health. The reductions made it harder for people to get help before they're in crisis, mental health advocates say, and even harder to find a hospital bed in an emergency. The practice of secluding or restraining children when they get agitated has long been a controversial practice in public schools. Now, new data show that it's more common than previously understood, happening at least 267,000 times in a recent school year. NPR worked with reporters from the investigative journalism group ProPublica, who compiled data from the U.S. Department of Education to come up with one of the clearest looks at the practice of seclusion and restraint. U.S. Senator Richard Blumenthal wants the VA to explain why veterans are waiting longer than 30 days to be seen in Connecticut and nationwide.